Dr. K.T. Achaya, books — Indian Food, A Historical Companion, The Food Industries of British India, and A Historical Dictionary of Indian Food ~ are a scholarly fund of the history and development of India cuisine. They educate as they enlighten and entertain, and occasionally shock us. For example, he points out authoritatively that while Dosai and Vadai have a hoary two-thousand-year history in Tamil country, Idli is a foreign import. The earliest reference to something of a precursor to Idli occurs in the Kannada writing of Sivakotyacharya in 920 AD, and in the subsequent Sanskrit Manasollasa (1130 AD). 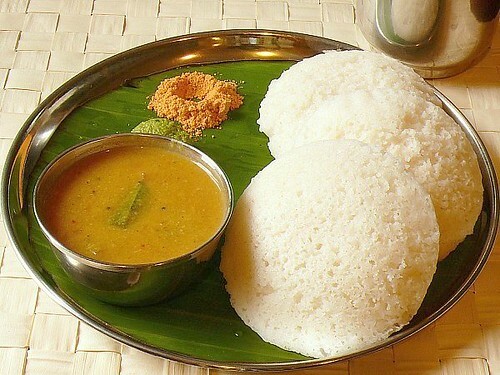 But the three elements of modern Idli making are missing in these references: use of rice grits along with urad dal, the long fermentation of the mix, and steaming the batter to fluffiness. Indeed, the Chinese chronicler Xuang Zang categorically stated that there were no steaming vessels in India. Achaya writes that the cooks who accompanied the Hindu Kings of Indonesia between 800-1200 AD, brought fermentation and steaming methods and their dish Kedli to South India (Thirai Kadal Odiyum Tinpandam Thedu!) –" The Hindu"
Having come from Trichy, Tamilnadu, Amma made very good idlis! Making steaming, fluffy white idlies each morning was a ritual for her. As kids we grumbled about having idlis very often but now I realize what a wonderful breakfast it is-with good proteins and carbohydrates. She passed down this recipe to which I made some changes, considering the type of Dhal/ Paruppu, Idli Rice and of course the climate here in Seattle. The process starts a day before to soak, grind and ferment so that it would be ready for the next day. Cooking is an art and every art needs patience. Making Idlis also needs some patience too. My daughter loves idlis and she will have couple more if I make idlies with Sambhar. So here is the recipe which might be the same recipe from most people but I wanted to pass on the recipe from my Amma to you! 1 Cup Urid Dhal/Ullutham Paruppu. Soak the rice for four hours and dhal for about 45 minutes. Grind the dhal first in a wet grinder for 30 to 40 minutes or until it is fluffy.When you take it in your hands it should be very light.Transfer into a vessel. Grind the rice to fine rawai consistency (make sure it is not ground to a very fine paste) .Mix the rice, dhal and salt and allow to ferment or until it rises to double the quantity.Now mix the batter lightly and pour into the idli moulds and cook for 10 minutes. Enjoy Idlis with sambar,coconut chutney or just milagai podi . I usually ferment the batter by placing the container of batter in the oven and switching on the oven light during winter months. The batter ferments in about 12 Hrs. During summer when I keep it out, it takes the same time. My mother feels that making idlis in the traditional method of putting the wet cloth on the mould results in soft and fluffy idli. I got to know abour site from Mahanandi. Iam from Hyderabad,AP. I like the way u r presenting the recipes with detailed explanation about the past of the dish etc. Pictures are also good. I see that u r born in secunderabad. I dont know Tamil. I have a request/suugestion.could u please post the recipe names in telugu as well as u know telugu,it will be helpful for people like me. Thank you Anamika for your suggestion. I will try to put up Telugu names in the Glossary section. I am in the process of updating.It will be up soon. this post looks really good and I really like the pictures of the rice...you have some really great talent and I wish for you to express it...your blog is really good and I am new to looking at your blog...so far it is really good! In temperate climates like India, the batter usually ferments in about 5 to 6 hrs. If you live in colder temperatures it is advisable to keep in the batter in an oven with the lights switched on. The heat from the light helps in fermenting. Some people use yeast to help in fermenting.I have not had problems with the fermentation so I have not tried it myself. Let me know where you live and I can try to help. I got them at a Mexican grocery store. I find them in Indian & Chinese stores these days too. 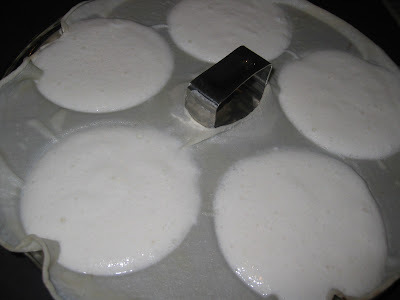 Please refer to my other post on homemade Idli batter.